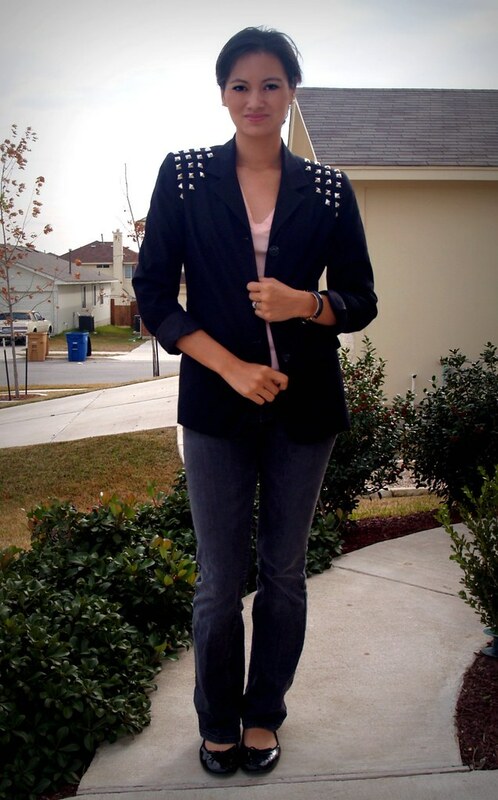 I finally finished my DIY studded blazer! After I got the proper tools, I had no more stabbing accidents. Hooray! Needle nose pliers, an icepick, and a flat screwdriver are necessities! occasion: Costco, Hobby Lobby, and the post office! 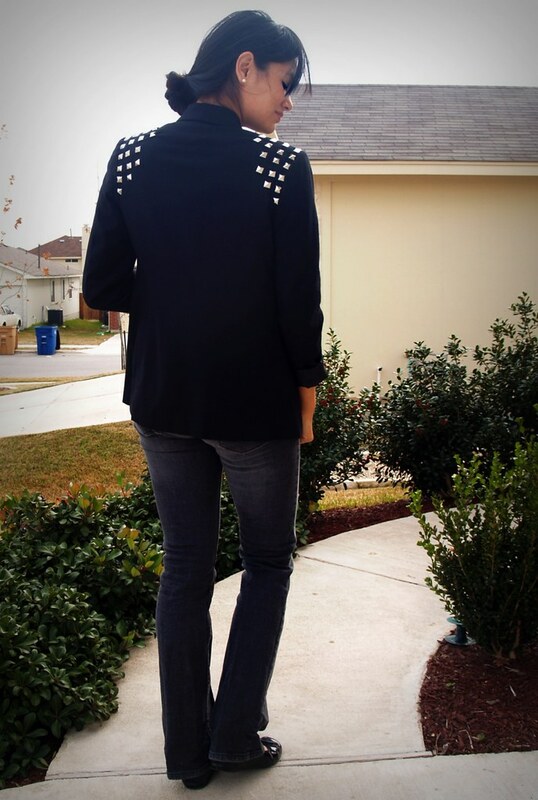 Because I (accidentally) added a couple of extra rows of studs, it turns out that I actually like my DIY blazer better than the Silence and Noise one I was emulating. The project was a little harder than I anticipated, as I had to buy an icepick to poke the stud holes since I was trying to attach the studs through some well endowed shoulder pads. Total spent? $14.00. 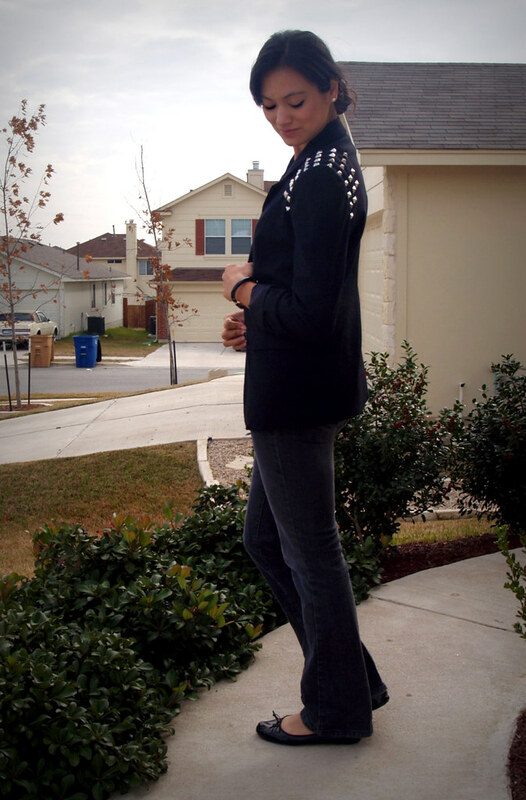 The blazer cost $5.99 at Savers, the studs were $5.99 for 100 on eBay, and the ice pick was $1.99 at the grocery store. Punctured thumb and all, it was totally worth it. Because my jacket was lined, I cut inch and a half holes in the lining at the seam of the sleeve and the shoulders. I chose to do this so the stud backs would be under the lining and therefore less likely to snag my clothing. 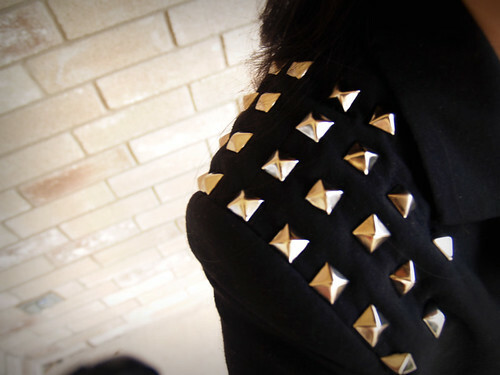 Going from an inspiration picture, I placed the first row of studs along the top shoulder seam. I started with the furthest most stud (placed exactly in the corner of the sleeve and and shoulder seam) and worked my way in. Each stud was uniformly spaced with a 1/2'' space (the same size of the stud) between each stud. 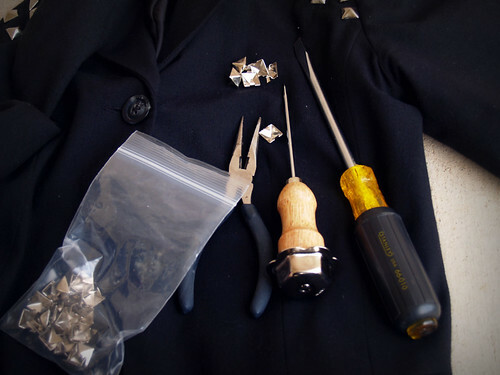 To place each individual stud, with the metal tabs on the top and the bottom (versus left and right) I pressed the metal tabs into the fabric to score it. I used the ice pick to poke through the material and the shoulder pad and placed the stud in the holes. Using the needle nose pliers, I folded/ bent the metal tabs until they were flush against the stud back. When necessary I used the flat screwdriver to push each tab in further. I didn't worry if the fabric looked pulled or if the studs weren't lined up perfectly. I did the corrections after all 68 studs were placed. No fear: the poked mistake holes close back up when the studs are repositioned. If you know how to sew, you can sew up the small cuts you made in the lining. Shopping for Christmas gifts with a broken toe. In other words: ouch.